Noun. Also calory. Mid-19th century. equal to approximately 4.19 joule (also called small calorie, abbreviation cal). Having been too lazy to ever count a calorie in my life, I was recently in the unenviable position of having to fast (which is as fun as it doesn't sound) by keeping my calorific intake to under 600 for a couple of days. "That's OK," I thought, "with all the emphasis on clear food labelling thanks to the obesity epidemic in the West, it should be a doddle to understand how many calories any given food contains." Well, no, it wasn't. Although I've never been particularly adept at understanding charts, I found the whole 'calorie' concept thoroughly mystifying. What's a kcal? What's the difference between a cal and a Cal? And why do I care how many kilojoules or amps or gigawatts or whatever are in my food? 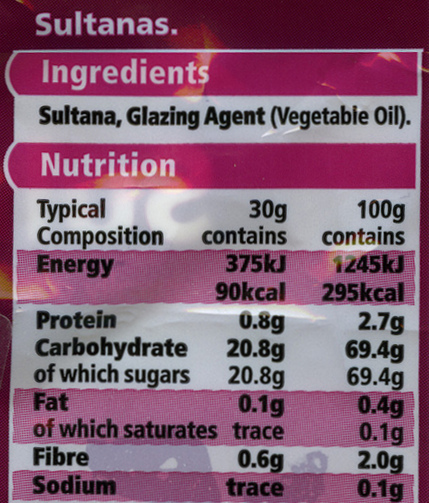 And seeing as k normally means 1,000, am I to believe that this 100g packet of sultanas (see above picture) really contains 295,000 calories? 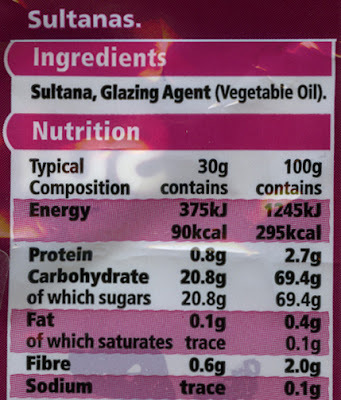 Well, in answer to that last question, bizarrely yes - that 100g packet does contain 295,000 calories, but the food labellers have (un)helpfully decided to express that as 295kcal. The confusion arises because calories aren't really anything to do with food; rather, they're units of energy, and specifically a unit which can raise the temperature of 1g of water by 1 degree centigrade - one thousand of these units is popularly used as a unit of the energy we get from our food. Thus, while these are properly expressed as kcals (1000 calories), one kcal does equal the type of calorie so many people are used to counting. Yes, that packet does properly contain 295,000 calories (of the small, scientific kind), but in the popular consciousness this is 295 calories. This saves us the effort of both having to say two-hundred-and-ninety-five-thousand calories, and having to read or write kilo every time we're reading or writing the word calorie (though it's probably such pathetic corner-cutting and laziness that has resulted in us all being so fat in the first place). If this wasn't all confusing enough, various bods, like the laugh-a-minute bunch over at The International System of Units, have attempted to make it simpler for fat plebs like us. For example, some numb-nuts thought it would be nice and clear to simply capitalise the bigger calorie, so that 1,000 calories, or the kilocalorie, is written Cal (that's the one dieters are interested in), while the small calorie is written cal - as if no one is ever going to be confused by that. Also, it's been determined by those with bigger brains than us that a calorie (the little one) is about 4.19 joules of energy, which is handy because so many of us think in joules, right? Calorie comes from the Latin calor meaning heat (think of Calor Gas) and is a unit of energy, specifically the energy it takes to heat a certain weight of water. What is commonly called a calorie in dieting lingo is actually a kilocalorie (1,000 calories), and is thus written correctly as kcal, although you will also see Cal and calorie written too. If, like so many of us, you'd rather work in joules, just remember that one kilocalorie (or one food calorie of the type that everyone talks about) is roughly equivalent to 4,190 joules, which you can work out by ... oh for goodness sake ... who really wants to work in joules when tucking into a Big Mac? Just enjoy yourself. Does this make things a little bit clearer? Do you prefer to count your calories in Cals, cals, kcals, joules, kilojoules or Snickers? Do please heat your own waters by leaving your most nutritious comments below. 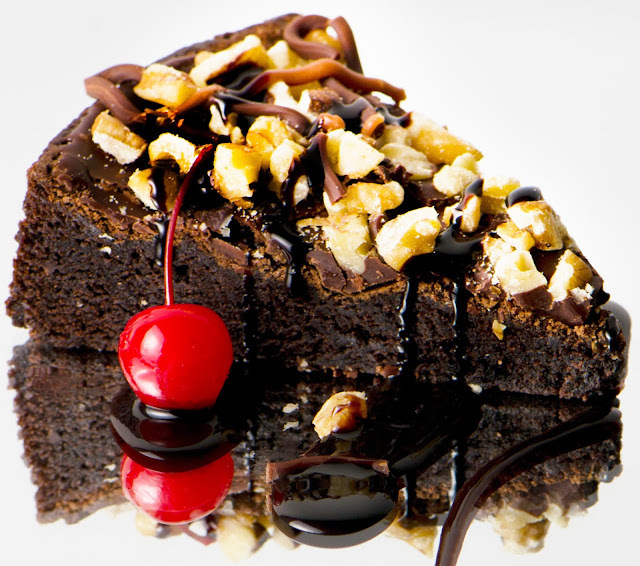 Leave it to you fun-killer to bring up calories around the holidays. I'm off to eat all the food in Dublin. That'll show you and your charts. Well maybe it is a little. I'm starting my day with pancakes, and American style pancakes at that. Except I'm gonna eat all the food in northern BC! Hope you and yours have very Happy Christmas Eddie. I count my calories in happiness. Portion of lettuce: small happiness. Bar of côte d'or truffé noir: big happiness. See, it's really simple. Wow wow wow ... now that's calorie counting. Although, since when did a small portion of lettuce give anyone happiness, other than maybe a rabbit? It's only in combination with other things ... say, for example, bacon and tomato ... that lettuce provides any type of delight. When I get a giant plate filled with meat and chips, some lettuce brings happiness because it makes me think I'm not really clogging my arteries. See, small happiness within big happiness. It's all possible! At last I can achieve my ambition to eat two million calories in a day. OK, Sally ... on your marks, get set .... go!